Residential solar panels are becoming the newest craze in the ‘go green era’. But how effective are they? Is the cost worth the benefit? This page will attempt to answer that question. The answer to this questions really depends on the region where you live. If you live in a state that has lots of sunshine such as Arizona, California, Massachusetts, or New Jersey, a residential solar system can pay for it's self in as little as 3 to 5 years. If you live in a region where the sun isn't always shining, then you will be looking at a longer time frame until the solar panels are worth what they cost. The average residential solar system costs approximately $35,000. In 2010, the average Arizona homeowner payed ($5.64/Watt) for solar energy. After you have saved enough energy to have paid for the system, your electric bill would resemble the image below. (getsolar.com) Typically, those who have residential solar panel systems must still have electric service to their house, so they have electricity when the sun is not shining. The decision is yours, whether the systems are worth it or not. -Power is only generating when the sun is shining. My family was recently considering getting solar panels put on our house because of the tax credits that are available. It has always been something that we have discussed doing, because we would like to lower our electric bill and help out the environment as well. However,we did some research and came to the conclusion that our house would not be the correct situation to have panels installed. There were many reasons why we decided to not have the panels installed. Among those reasons, our greatest concern was the cost. 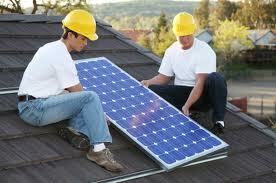 Solar panels are currently in the peak of their popularity which makes them a hot commodity. Our theory is that if we wait a few years, then the cost will be significantly lower. Not only is the cost fairly high, but if we decided to sell the house while we had a loan out for the panels still, we would have to negotiate the panel contract with potential buyers. One day we will have solar panels installed on our house. But it will not likely be until they come down in price. Remember what a big screen TV cost 10 years ago? That is our thought process behind it. Solar energy is definitely the way of the future, and I look forward to one day being a part of it.